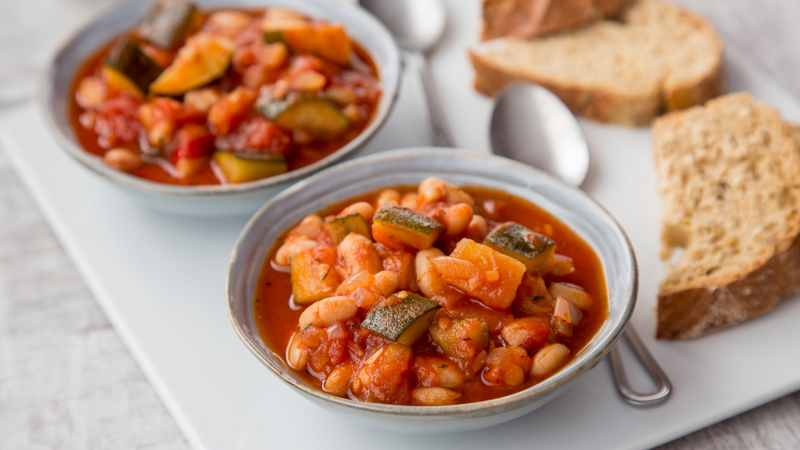 A simple, tasty dinner that works well served with brown rice or Vegan friendly bread. 1. Heat the oil in a large pan on a high heat. Add the onions, garlic and chilli and cook for 4 minutes, stirring regularly. You want the onions to brown nicely. Add the courgette and a pinch of salt and cook for a further 4 minutes, until the courgette starts to brown and wilt down. 2. Add all the remaining ingredients and stir to mix together. Bring to the boil, then reduce to a gentle simmer for a further 5 minutes. 3. Remove the pan from the heat and adjust the seasoning to your taste. Ladle into bowls and garnish with fresh herbs and chilli flakes.